Divide the pineapple between four tumblers. Mix together the yogurt and the honey and spoon half of it over the pineapple. 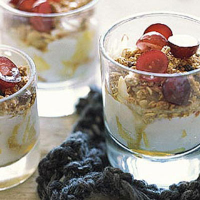 Scatter over the apple and the Oat Crunch, then spoon over the remaining yogurt. Top with the grapes then cover and chill overnight. Serve with a splash of extra apple juice or milk, if you like. This is a brilliantly portable breakfast. Pack in small plastic containers, or recycle tubs from the deli counter.